I was lucky to receive an advanced copy of Brand Delusions. I had just left my company as CEO, to start a new corporate adventure with Inman News. The timing could not have been better. I was about to view the meaning of “brand” from an entirely new perspective. I have to disclose that I had a personal interest in this book long before it was written. 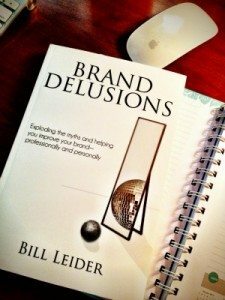 I was first exposed to the concepts and philosophy of this book, in a series of blog posts, by a friend, Jeff Turner, whose mentor is Bill Leider, the author of Brand Delusions. I had just begun my journey as an entrepreneur, and the philosophy of values based management made a profound impression. As such, my anticipation was quite high. Brand Delusions is a book that takes you, the reader, on an internal, strategic, entertaining and inspiring journey. By exploring the ill-conceived concepts and conventions of corporate brand through a fictional story, you will come away with a greater understanding of your “personal brand”, and the umbrella of your “corporate brand.” Why is this important? If you have a website, logo, business cards and a tag-line, isn’t this enough? The short answer is “heck no”. What kind of experience do we want to deliver? What will it take to deliver that experience? Is it worth it?- What do we gain by doing it? Your core values, your culture, (how you live and breathe your values) execution of service, and consumer experience are all “your brand”. Failing to deliver on any part of it weakens and damages your brand. Even the people you outsource services to on behalf of your company are part of your brand. In real estate, we tend to think that Escrow, Title, Mortgage, Inspectors, etc, are not part of our brand. But they are. In today’s real estate landscape, new business models are taking shape and consumer’s needs are changing at a rapid pace with technology. No longer can you operate within the silos of your brokerage to build your brand, at least not for the long term. It’s not about logos, color palettes, and tag-line. Understanding YOUR values, building YOUR culture is what builds a strong brand. How can you build your brand with those around you that provide support? How do THEY deliver on your brand promise? Why is your brand promise the most important thing you can deliver? Without a commitment to your brand promise, you’re just a business with good intentions. Go on this journey in Brand Delusions. It will help you define what you truly are as a brand, what you could be, and ideas to build your own culture to get you there. Learn to identify opportunities, say no to the relationships that go against your values and strengthen the promise of what you deliver and how you deliver it with holistic awareness. The power in that could change your business and your life. If you would like to hear from Bill personally, or join us on a G+ Hangout, let me know in the comments below! I know we would have an amazing conversation.